Allies of President Donald Trump tried to rationalize a poor performance by the Republican candidate in Tuesday’s special election in Pennsylvania. They blamed Republican candidate Rick Saccone for not embracing Trump on the campaign trail. President Donald Trump’s allies tied themselves in knots to explain why Republican Rick Saccone was underperforming in the special election for Pennsylvania’s 18th Congressional District on Tuesday. 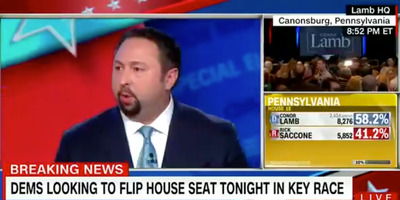 Saccone, a state legislator who called himself “Trump before Trump” and sought to tie himself closely to the president throughout his campaign, was viewed by many Republicans as a poor candidate who was unable to fundraise well for his candidacy. Many view the district’s special election as a referendum on a president who won the area by 20 points in 2016. But his allies sought to give him some distance from Saccone. After another panelist pointed out that Saccone fashioned himself as “Trump before Trump,” Miller pointed to Saccone’s fundraising numbers.